At any given moment, there are approximately a zillion different crowdfunding campaigns happening on the web. Take a stroll through Kickstarter or Indiegogo and you’ll find no shortage of weird, useless, and downright stupid projects out there — alongside some real gems. We’ve cut through the fidget spinners and janky iPhone cases to round up the most unusual, ambitious, and exciting new crowdfunding projects out there this week. That said, keep in mind that any crowdfunding project — even the best intentioned — can fail, so do your homework before cutting a check for the gadget of your dreams. Here’s DT’s Lulu Chang with the scoop: “The Purisoo hopes to serve as your emergency resource when it comes to attaining filtered, potable drinking water. Capable of processing up to one thousand liters of water (or about two thousand bottles of water), the Purisoo’s replaceable filters capture and eliminate impurities from fresh water sources. You can collect water from a river, a lake, or even the tap at a campground, and begin pumping away the potential contaminants. Unlike other water bottles or purification techniques, which effectively require you to store unpurified water and purified water in the same place, the Purisoo never actually contains any contaminated liquid. Instead, you’ll begin pumping the Purisoo directly from the water source — purified water will then be pumped into the body of the bottle, and you’ll be able to serve fresh, clean water at your convenience. When you’re in the water, diving fins are awesome. They allow you to swim faster, use less effort, and move gracefully through the ocean. However, it’s a different story during those moments between when you’re on land and when you’re fully submerged. Walking with fins on your feet is a surefire way to look and feel awkward. But what if it didn’t have to be like that? What if there was an easy way to clip in and out of your diving fins, similarly to how you clip in and our of a pair of skis? Good news — there is! Meet the Aquabionic Abs system. On the spectrum of additive manufacturing, there are consumer-level 3D printers at one end, and industrial-level 3D printers at the other — and very little in between. Consumer printers are cheap, compact, and can produce relatively small parts, but if you want to print something bigger, your only option is to upgrade to an industrial printer — which are oftentimes more expensive than your average sports car. Printing big parts (say, over a one cubic foot in volume) is still largely out of reach for most consumers. Australian outfit Cultivate3D wants to change that, and has built a badass new printer to make it happen. The Beast V2, as they call it, boasts a massive 18.5 x 17 x 27-inch build area — making it possible to print a wide variety of objects that you otherwise wouldn’t be able to. It’s also got a relatively high print resolution, and an unprecedented four-nozzle extrusion system that makes it possible to print four objects at once. Don’t even get us started on the e3D HotEnd and Titan extruders. This thing truly is a beast. And the best part? Even with all these awesome features, it still costs less than $2,300. If you’re not already familiar with Moment, allow us to give you the scoop. Moment is a Seattle-based startup that makes the best smartphone photography lenses on the planet. Unlike some of the cheaper models you can buy, Moment lenses are damn near perfect, and won’t leave you with any image distortion, chromatic aberration, or blurring around the edges of your photos. The company has launched two successful kickstarter campaigns, and is now back with a third one — this time with a full suite of mobile photography/videography tools. Loomo is the latest contraption from Ninebot — the company that acquired Segway in 2015. It’s pretty much exactly what you’d expect from a robotics company that owns Segway, because, well, it’s basically just a robot brain that rides around on two self-balancing wheels like some sort of dystopian mall cop. It’s actually kind of nifty, though. You can spin the robot’s head and ride it around like a normal Segway, then hop off, spin the head back around to wake up the robot, and have it follow you around autonomously while you’re not riding. 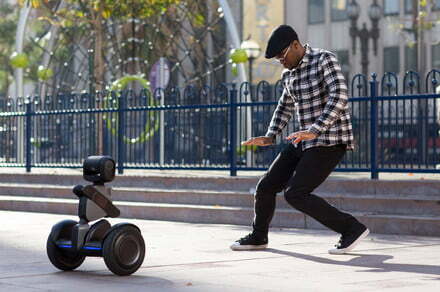 It’s also worth noting that Ninebot doesn’t need Indiegogo to raise money for production costs. It’s really just using the crowdfunding platform as a marketing vessel — so you likely don’t have to worry about missed deadlines or delayed shipping. Ninebot knows how to bring a product to life. Is Apple poised to make a push into content production?